Sweaty but very, very happy! The Coop was in the shop, needing a battery, and the snow was great. I couldn’t miss it. So, I pulled out Hellga and loaded up the back pack. Back in the early 90’s I was included in an article in Ski magazine about ski bums. Apparently I still have a little of that blood in me. I have an old backpack that is designed to carry skis. So, I thought I’d share how to pull this off. First, you must wear a helmet to save your head when the skis tip forward and smack the back of your head. Second, is to use two yoga blocks in the bag to save your back from the buckles from the ski boots and the overall weight of the pack from digging into the spine. Third, don’t wear your ski boots on the bike! I suggest a winter boot or sneakers depending on the weather. Fourth, I also suggest boots or sneakers in case you need to get off and walk. Fifth, you need to have good balance and anticipate the shift in weight of the skis might send you or surprise you causing you to lose your balance. Sixth, be sure you are not so bundled that you can’t turn your head and look back over your shoulder to look for cars. Seventh, bike fenders are a must so you are not covered in slush before arriving at the ski area with a giant brown spotted stripe up your back. Eighth, wear as much of your ski clothing as you can so the backpack isn’t so heavy, BUT be sure not to sweat on the bike ride! If you overheat and get sweaty you are more likely to get chilled or frozen on the first run. Bar mitts are helpful to keep the hands warm. I save my big ski mitts and stuff them in the backpack and wear light weight gloves. Ski goggles, well that depends on the weather. On a snowy day, the goggles are great. A warm day, they are hot, but do keep the dirt out. So, make a call. Ninth, the road salt is very bad for the bike, so brush it off when dry-leave time to do that after each ride. Tenth, be sure to bring a bike lock with you to lock the bike somewhere at the ski area. Eleventh, take some air out of the tires when it is slippery to give you more traction. The extra weight of from the skis helps with traction. Twelfth, once you get the skis into the side sleeve, designed for the skis, I stuffed the poles grip side down into an outside pocket then strapped the skis together with the poles between them. Lastly, pack the bag as balanced as you can. 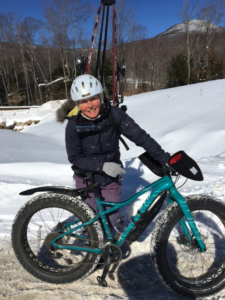 I have had a few rides where the weight shifted and the skis where over my right shoulder. It seemed a little dangerous if a truck came a little too close to me and caught the skis as they hung off the side. This is also very uncomfortable! I gotta be honest, this sh*t is heavy! It is work, but an adventure. Love it! If you give it a try, let me know, send a picture! This entry was posted in Biking, Blog, Health and Nutrition. Bookmark the permalink.